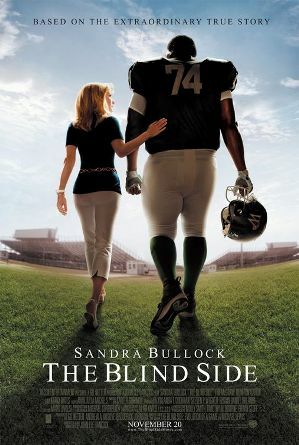 The Blind Side was a pathetic example of Hollywood racism. The fact that Sandra Bullock won the Best Actress Academy Award in 2009 means that it will be remembered for years to come. That is a real shame because this movie takes up valuable real estate in my brain and I wish I never sat through this picture. Someone mentioned this film to me the other day praising it. As they were doing that, it brought back a lot of bad memories about how ill-conceived this picture was. So much so, that I immediately felt the need to write about how wrong I feel critics and audiences perceived The Blind Side when this was released. Based on the true story of Michael Oher, a homeless and traumatized boy who became an All American football player and first round NFL draft pick with the help of a caring woman and her family. But like some other unfortunate instances, Oscar voters ate up all the sugary goodness in this movie and did not ask for a film that went a little bit deeper and focused on the real struggles that Michael Oher probably went through. Instead, it focused on the struggles of an upper class, privileged Southern Belle who had some free time on her hands to take care of a poor black child. After I typed that sentence, it made me think how much Steve Martin and Bernadette Peters were more deserving of Oscars for The Jerk than anyone involved in The Blind Side. If you do not understand why, I beg you to see The Jerk. You will laugh and understand that reference. It was meant to be a nice, uplifting family drama about overcoming adversity. Following the formula perfected by Rocky and used in hundreds of other sports movies to the point of tedious redundancy. This movie is the Hollywood community patting themselves on the back to prove that they are accepting of the poor and minorities. However this movie does not focus on Michael Oher, it instead chooses to make the beautiful, rich white woman the main character and by doing that it makes this movie beyond offensive. If it did focus on Michael Oher as much as it did Sandra Bullock’s character we would have a completely different movie, one that would be much more akin to Precious (which was also released in 2009 and nominated with The Blind Side for Best Picture and Best Actress, Gabourey Sidibe) than the feel-good picture everyone embraced. So it would not have had the nice friendly PG-13 rating, therefore it would have turned a lot more people off, and by doing that, made The Blind Side a lot less profitable in the end. I guess I like my Oscar winning pictures to be brutally honest, not sweet and superficial moneymakers. As I type this article it feels therapeutic to pan and slam such a despicable movie. I realize that I have not really commented on the acting, directing, writing, editing or any other technical aspects of this film. I have not seen The Blind Side in a few years nor do I wish to revisit it anytime soon. I remember it being competently directed by John Lee Hancock who directed Disney’s The Rookie from 2002 with Dennis Quaid, a much better sports movie which I enjoyed. The actors besides Sandra Bullock were nothing special. None of them were remotely interesting or memorable as the script only allowed Bullock’s character to stand out and steal the scenes from everyone else. Overall the film was average, nothing stood out as amazing, but nothing was terrible either. The message of The Blind Side is downright disgraceful. It says that all poor black people need a beautiful, wealthy white woman to take them under their wing and only then, can they succeed in America. All black people should be so lucky to have a perfect, wholesome, rich white family adopt them. Sickening to me, that in 2009, this passed for an Oscar winning motion picture.